Prime Minister Sheikh Hasina has urged the police to remain careful and vigilant so that innocent people are not harassed and tortured during their duties. "You need to keep in mind that no innocent person should fall victim to torture and harassment by you," she said. Prime Minister Sheikh Hasina also expressed her government’s firm resolve to make Bangladesh Police a people-friendly organization, on Monday. She said: “In 2009, the police-people ratio stood at 1:1355; however, our government has decreased it to 1:801. "The government will continue to enhance the police’s strength to meet future demand and improve the police-to-people ratio. The government will continue to enhance its strength in accordance with prevailing demand." 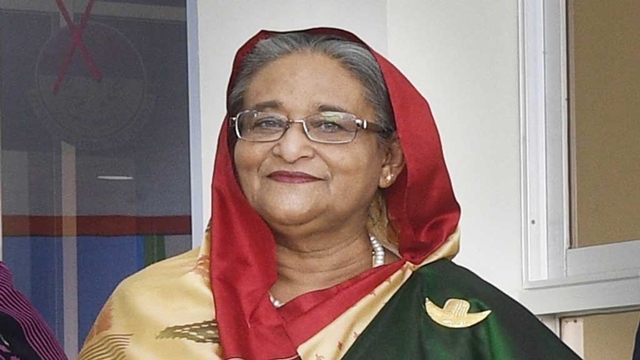 In its Election Manifesto, Bangladesh Awami League had prioritized making the police force a people-friendly organization, Prime Minister Sheikh Hasina noted, reports BSS. “We consider the allocation of police as an investment, and not an expenditure. Bangladesh Police has had a facelift as a result of our government’s various positive measures,” she said. Home Minister Asaduzzaman Khan Kamal, Inspector General of Police (IGP) Jabed Patwari, and senior government officials were also present during the event. Cabinet members, MPs, senior government officials, leaders of various professional bodies, and members of civil society also attended the function. The prime minister presented 349 police personnel with a Bangladesh Police Medal (BPM) or President Police Medal (PPM) in recognition of their professional excellence. Out of them, 104 received a BPM (service) and 40 received a BPM (bravery) medal; while 143 received a PPM (service) and 62 received a PPM (bravery) medal. Sheikh Hasina hoped that the awards would motivate them to be more spirited in discharging their duties, urging police to play a more proactive role in ensuring road safety and countering drug abuse. On the occasion, a parade was arranged at Rajarbag Police Lines. The prime minister inspected the parade and was saluted by different contingents of Bangladesh Police. “Police have to be people-centric in order to address the emerging trends of crime. They need to build friendly ties with people so that the unfounded fear of police does not discourage people from receiving services,” the prime minister said. Police as law enforcement must be people-friendly and uphold human rights, fundamental rights, and the rule of law, while performing its duties, she said; adding: “Only then will police be able to attain the identity of ‘pro-people’ police”. Mentioning that Bangladesh Police symbolizes peace, security, and discipline, the premier said, imbued with the essence of the War of Independence, its members are accomplishing their delegated responsibilities to maintain law and order with the utmost professionalism and great courage. The prime minister said in the recent general polls, the police ensured peace and order. For this she extended her heartfelt thanks to all the members of Bangladesh Police. She also praised the role of the police force in preventing subversive activities of the anti-democratic, anti-liberation, and communal allies of BNP-Jamaat and their cohorts in 2013, 2014, and 2015. The prime minister also commended the role of the police force in the aftermath of Holey Artisan and Sholakia terrorist incidents; in dismantling the organizational capacity of the terrorist entities successfully. “Terrorism and violent extremism create barriers to peace, stability, and development. A terrorist has no religion, caste, or creed,” she said, pointing out that several terrorist attacks and attempts have been made on her on a number of occasions. The prime minister announced Tk8 lakh will be given to the family of a police member in case of his or her death in the line of duty.